Kaboom! 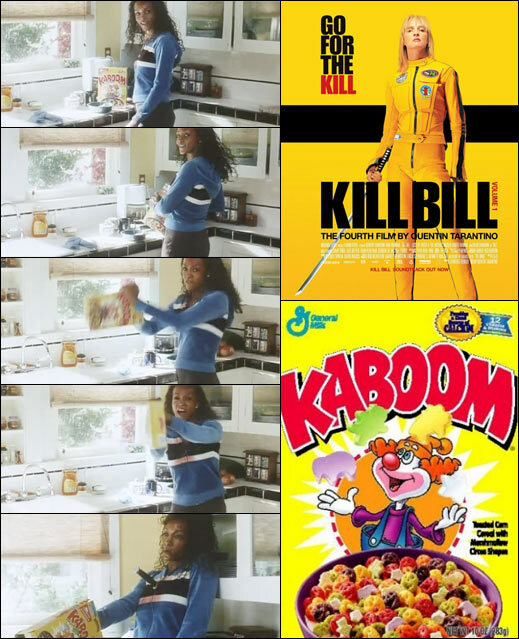 Cereal appears in Quentin Tarantino's 2003 film "Kill Bill: Vol. 1" as a hiding place for Vivica A. Fox's gun. Interestingly, the film also features Lucy Liu and Uma Thurman sharing the lines of the Trix Cereal catchphrase "Silly rabbit... Trix are for kids". This cereal was described on one of the first boxes like this: "100% minimum daily requirements of vitamins and iron in 1 oz. sugary oat cereal with marshmallows and stars!" The cereal pieces were colorful pieces meant to resemble the smiling face of a clown. The marshmallows came in the shapes of circus animals. 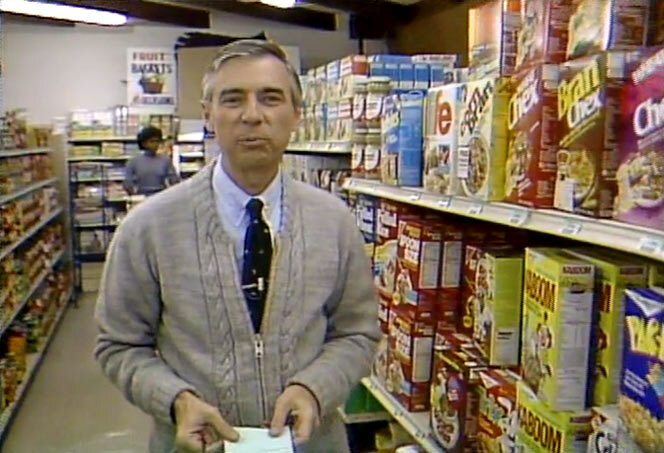 In a 1984 episode (#1529) of Mr. Rogers' Neighborhood, Mr. Rogers takes a trip down the cereal aisle where you can see Kaboom cereal along with other discontinued favorites like Pac-Man Cereal, Donkey Kong Cereal and Buc-Wheats. View all 118 comments for this cereal. It was really gross. I was always drawn in by the clown mascot (I love clown cereal mascots) and the yellow box (You never see yellow cereal boxes. What�s up with that?). Only bought it once. Back in 2015 when they put out Star Wars cereal, I decided to try it. Yeah, it was just Kaboom. Aside from the pieces being made out of corn instead of oats, it was the exact same. Both of them were even made by the same company, somewhat confirming my theory that they're just the same cereal. My kids and I loved Kaboom. A great cereal. I discovered Kaboom when I was in college. I always liked oat cereals, but the number of oat cereals was limited. I was looking for an alternative to Cheerios. I tried Kaboom, and it became my favorite cereal. It was better than Lucky Charms. 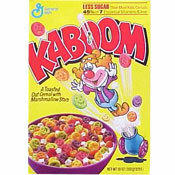 I ate Kaboom most mornings. I just ignored the creepy clown. I bought it periodically until it was discontinued around 2010. I miss my Kabooms. Could you put a commercial for Kaboom cereal on this page please? When Kaboom first came out it was a flop. Tasted like nasty natural vitamins but looked like Fruit Loops or one of those other delicious unhealthy cereals we were not allowed to have. Kaboom was on sale big time, since no one was buying it, and my mom bought like 5 cases of it, 100 boxes or so. 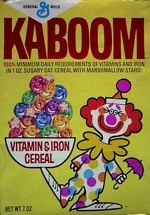 I ate Kaboom cereal every day for a year and my mom would not buy any more cereal until it was gone. So while it was nasty, tasted like a bottle of natural vitamins but looked colorful, I have fond memories of it since I looked at that box every morning for at least a year of my childhood. Granted all those vitamins when vitamins were not what most people took maybe added to my overall health, well being and smarts. Who knows. So nasty. I would hide it and give it to my dog. It tasted like cod liver oil and castor oil poured on colored cereal with marshmallows. I much preferred King Vitaman and Quisp. 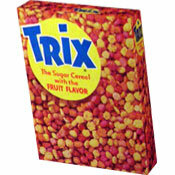 Now those were awesome cereals that I actually cried when they got taken off the shelf. I clapped when Kaboom was taken off. I get goosebumps now when I see an old box of it. Nasty memories. I remember having my mom buy me a box in the very early 1970's and I thought it was horrible. This is and was my FAVORITE cereal. I admit when I happened to find it at a store I would by at least 5 boxes if not all the ones they had on the shelf. Then they went and discontinued it... I NEED IT IN MY LIFE! I Miss you KABOOM! My favorite cereal as a kid, and boy was I excited when I heard the prettiest girl in school listed it as her favorite too. Then they discontinued it! Kaboom! Heather! Come back to me both of you!